The ceremony commenced with the ‘sow and grow’ welcome of guests by Principal Ms. Monika Mehan followed by the lamp lighting ceremony by the Guests of Honour for the occasion. After this, the school Principal addressed the gathering and inspired everyone with her words of wisdom. The student choir of the school presented a heart stealing welcome song followed by a contemporary dance presented by students of classes I and II. Student representative – Sanskar Bharti of class II filled everyone’s heart with gratitude with his emotional speech. Students of classes I and II sang a melodious song ‘People of the World’ which added glory to the day. The parent representatives also came forward and appreciated the commendable teaching-learning methodologies undertaken by the school. Another marvellous dance performance was given by the students of class I highlighting the importance of childhood. The Guests of Honour enlightened the gathering by their inspirational and motivating words. Parents were filled with joy to see their young ones in graduation robes and capes walking on stage with great happiness. All the students of class II and academic achievers of classes I and II were blessed by the Guests and School Principal. In the end a formal vote of thanks was proposed by the Supervisory Head of Classes I and II . The programme culminated with the chanting of Shanti Path by everyone. Graduation Day is a day full of joy, pride and accomplishments. M. L. Khanna D.A.V. 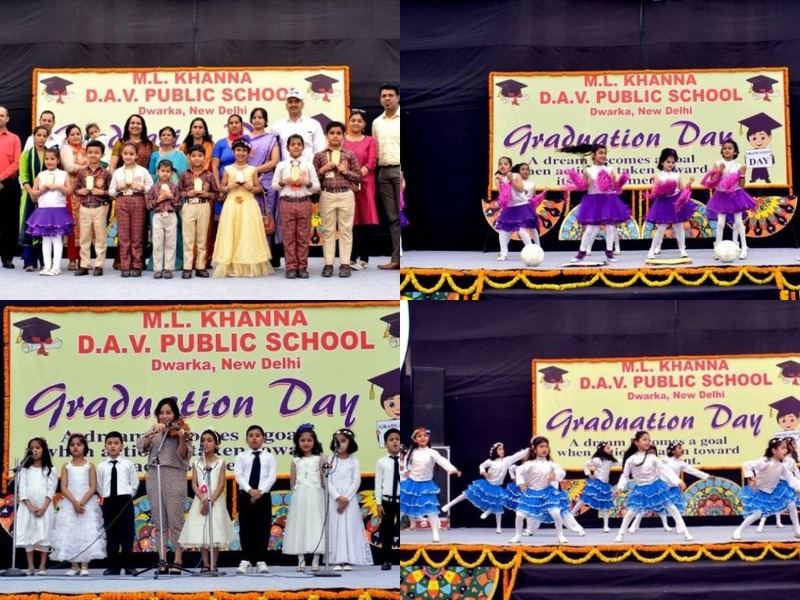 Public School, Dwarka organised Graduation Ceremony for the young learners of class II on March 20, 2018 in the school premises. The chief guest on the occasion was Dr Sharda Kumari, Principal (DIET), R.K. Puram. The ceremony commenced with the ‘sow and grow’ welcome of the chief guest by Principal Mrs. Monika Mehan which was followed by lamp lighting. After this, the school Principal addressed the gathering and inspired everyone with her words of wisdom. The programme progressed with Saraswati Vandana followed by the contemporary dance presented by students of class I. Student representative - Sanmil Dey of class II expressed his gratitude to teachers and school in his speech. Students of class I mesmerised everyone with the melodious song ‘”A gift to you” which added glory to the day. The parent representatives also came forward and appreciated the charismatic teaching and learning methodologies practised by the school. Another show stealing dance performance given by the students of class I was like cherry on the cake. The chief guest enlightened the gathering with her motivational words. Formal graduation ceremony took place and parents were filled with joy to see their young ones in graduation robes and caps walking on stage and being felicitated by the Principal and the Chief Guest. The programme culminated with the vote of thanks proposed by the Incharge of Classes I and II, followed by national anthem. The young enthusiastic learners of class II were applauded and felicitated for their commendable performance in the session 2016 – 17 during the Graduation Ceremony which was held on 17th March 2017. The occasion was graced by Mrs. Ghanapriya Elangbam, Country Coordinator for India, Generation Global, a project of the Tony Blair Faith Foundation. The ceremony was also attended by the parents of the students of class II. The celebration commenced with the ‘Sow and Grow’ welcome of the Chief Guest by Principal Monika Mehan. This was followed by lamp lighting ceremony and Sarswati Vandana to evoke the blessings of Goddess Saraswati. The gathering was then addressed by the Principal highlighting the vision of the school and role of parents and teachers in the student’s learning process. After this, the graceful and lively dancers of class I enthralled everyone with western dance. This was followed by reflections by student and parent representatives. The chief guest addressed the gathering and stressed on the importance of being tolerant and receptive in today’s time. After this, the young graduates of class II were conferred upon Graduation Certificates and trophies for their achievements. 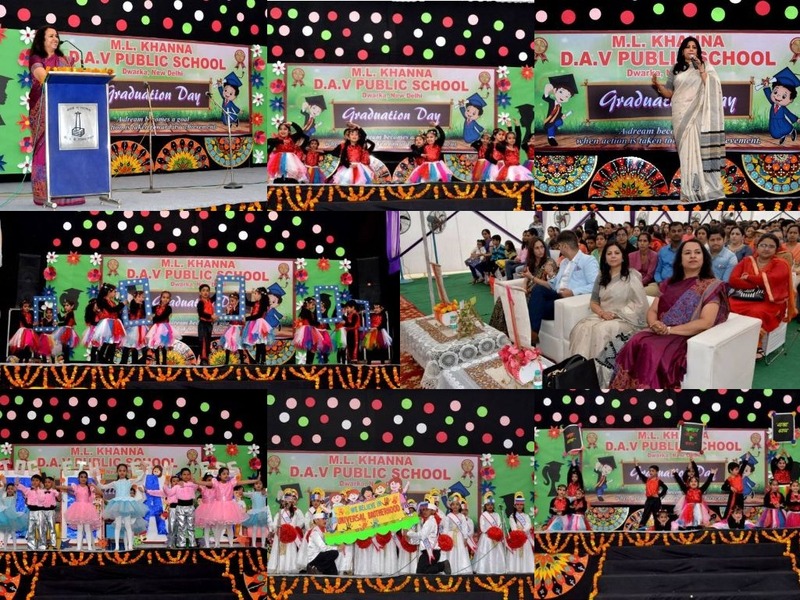 DAVDwarka celebrated the Graduation Ceremony for class II with great gusto and vigour. The programme commenced with the lighting of the lamp by revered guest,Dr. Chandra Mohan Bhagat, Director, Bhagat Hospitals Pvt. Ltd. The electrifying performance of the well synchronized western dance by students of class 1 enthralled the audience. 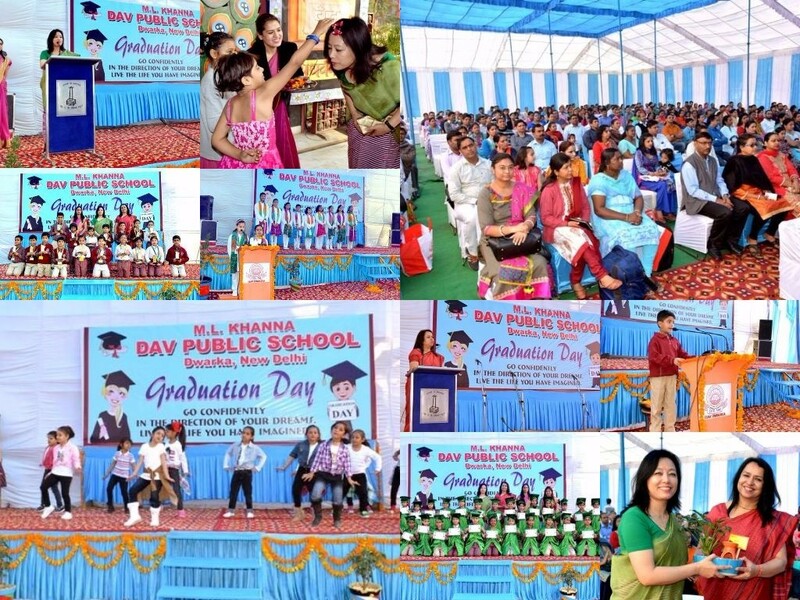 The little ones were felicitated with Graduation Certificates by the Chief Guest and Principal Ms. Monika Mehan. Dressed in blue and green robes, the children looked pretty. Their radiant smiling faces showed their happiness. The parents felt happy and proud to be a part of this memorable event. The Chief Guest congratulated all the scholars and through his speech counselled the parents to give their children the required freedom so that they become independent to take the right decisions in their life. The programme concluded with the vote of thanks by the Supervisory Head of classes I and II. D.A.V. 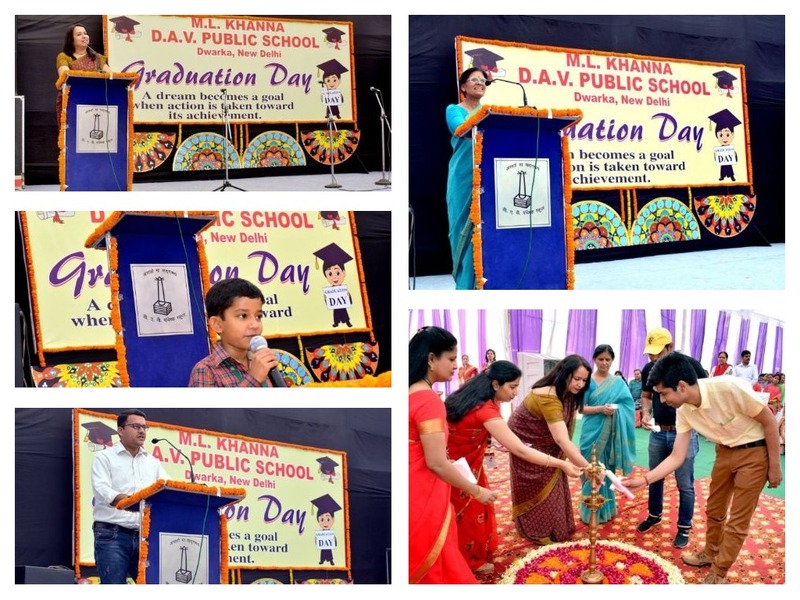 Dwarka celebrated the Graduation Day for second class on 24th March, 2015 with great gusto and vigour. The highly appreciated programme commenced with Gayatri Mantra followed by D.A.V.Anthem. The lighting of the hlamp was done by revered guests. The chief guests were the much acclaimed academician Dr Nitin Malik, Joint Registrar, GGSIPU and Educationist Ms. Sarita Kumar. They enlightened everyone with their invaluable words of wisdom. The electrifying performance of the well synchronized Salsa dance stole the heart of all the guests. Dressed in red and green robes with hats, the children looked like true scholars. Their radiant smiling faces showed their happiness to be a part of this extravaganza. The parents were also thrilled with a sense of pride to see their children receive this honour. The vote of thanks was given by Ms. Parveen Mutreja, Incharge of classes I and II. Principal Ms. Monika Mehan briefed the parents and teachers about their pivotal role in the right upbringing of the children. The programme concluded with National Anthem. The eventful day was a memorable experience for one and all.